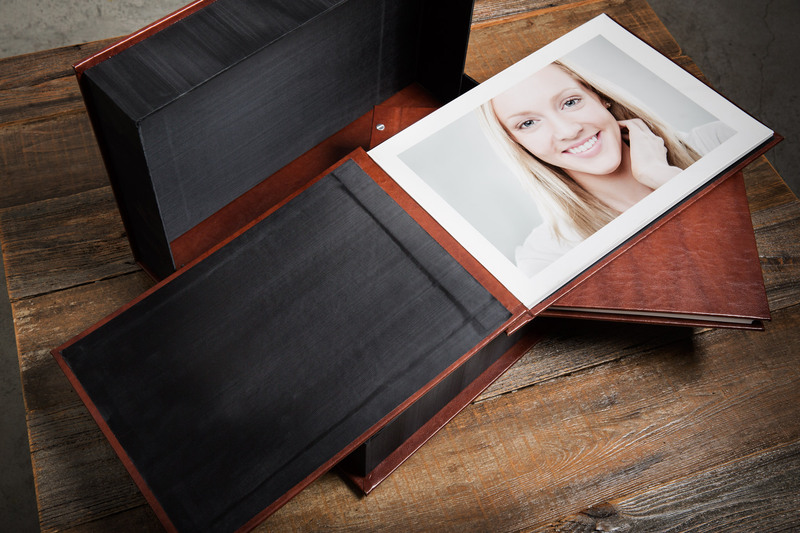 A portfolio, in the case of artists and photographers, is defined as a collection of works or documents that are representative of a person’s skills and accomplishments. I’ll admit, as a former gym owner coming from a world that was dominated by dumbbells and treadmills, I wasn’t sure what that meant. As far as I knew, a portfolio was something only “old time” artists and photographers had. I didn’t need a portfolio. I had the internet and Instagram. I have since reversed my thoughts on this and consider my portfolio my single greatest tool for selling my skills and abilities as a photographer. 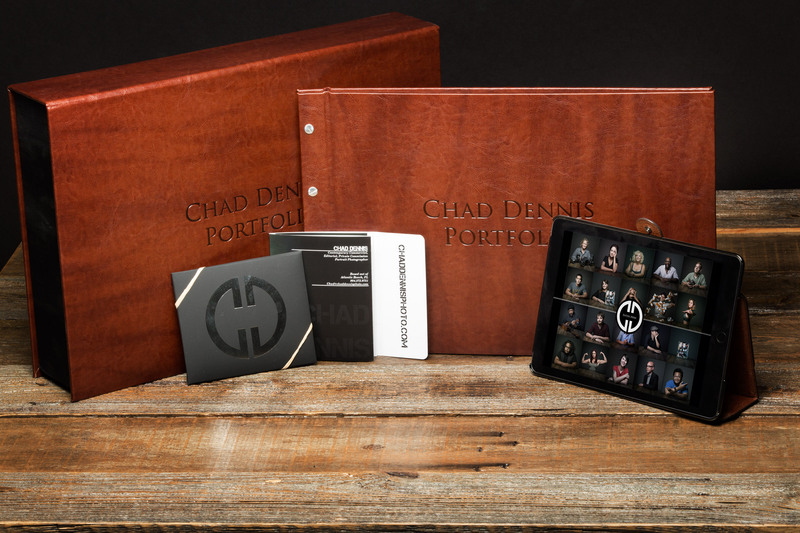 A properly designed portfolio speaks so much about you as a professional. That’s what we are going to talk about here. How to create a portfolio to reflect your personal voice as an artist. This, in turn, will help to get you hired by people who want to utilize that voice. I think there are four major things that a well put together portfolio require to speak your work or your “voice”: branding, competency, style, and expression. Let’s start with branding. In this day and age, branding is such a broad term that really could mean anything and everything. As you can see in the image above, all of my materials fit together. There is a uniformity that presents a consistent tone, feel and expression of my brand and the type of images I make. Personally, I like texture (okay, I love texture) and there is texture in the images I make. I like to think of texture in my images as having grit and depth. Not grit as in grime. Grit like your grandfather’s leather shoes he got when he was twenty years old and sixty years later still look brand new because he took care of them. He polished them every Sunday and replaced the soles when they wore out. 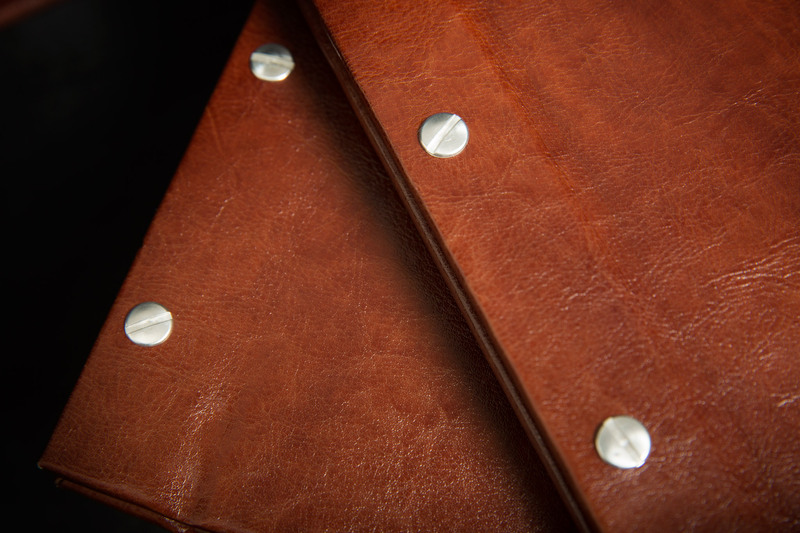 There is a quality that comes with something made from hand with the finest materials and has been lovingly cared for. That is why I chose the materials I did for my portfolio. I collaborated with a company out of New York to have that same feel that I believe my work represents. I wanted my portfolio to have texture and feeling, a richness of color that presented that same image to my clients. 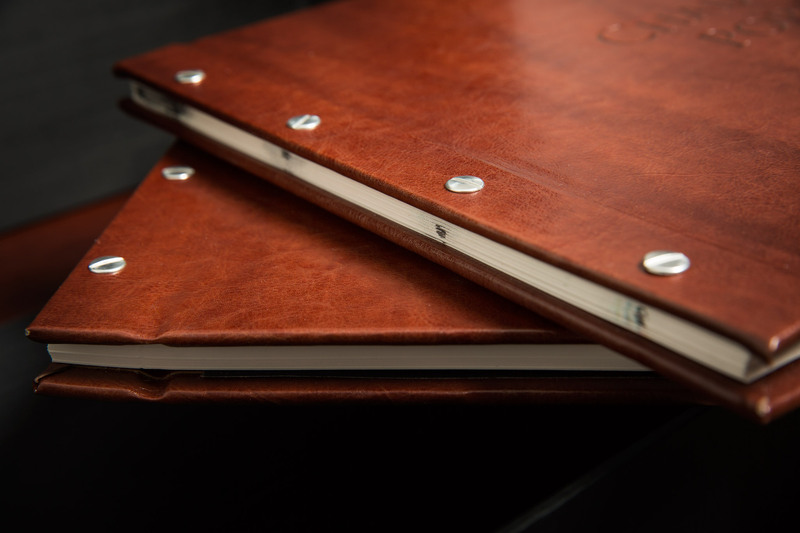 I went with a Cordovan Leather for the cover and had Chad Dennis Portfolio heat stamped into it. I also decided to have an exposed post with silver screws, again speaking to tone, texture and an old fashioned, handmade quality. Something that will last for years to come. On the inside cover, I chose a Japanese silk. Again, aiming for the high quality look and feel. A potential client is handling this and I am asking good money, if hired, to complete my work. From moment one, I want client to subconsciously be associating luxury, attention to detail and high quality with my work. It is all for a reason. It was designed for them to see the book, feel the book, experience the book and be blown away. 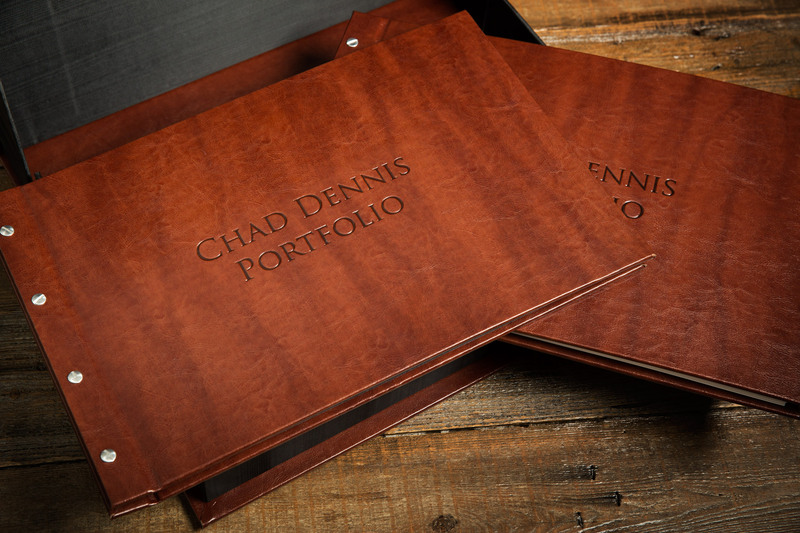 Now you might be asking: ‘if Chad is so worried about quality, why did he leave the black ink spill on the binding?’ Again, it adds to the external texture of the portfolio. It didn’t bleed into the picture, it is only seen from the outside. Speaking of the paper, I went through several rounds of printing to find the right paper. When you are making a print the media choice can impact the look and feel of an image immensely. Gloss, high gloss, matte, pearl, rag, flat, photographique, museum, fine art. The list goes on and on, and for good reason. When a potential client is looking at your images you don’t want them fighting glare to see your work. Gloss and high gloss, in my opinion, are a nightmare for this. I mean, heck, you can look at a picture I took of John Smith but you’ll have to look around your own reflection to even see the picture. Ok then, why not a matte finish? Matte finish can sometimes get blocked up in the shadows and shadows are a crucial part of my images. That is the thought process you have to go through when choosing the right media for your images. After a week’s worth of printing, I finally decided on Hahnemule Photo Rag Pearl (320 gsm). For me, it has a nice weight and thickness. Think about when you’re handed a business card, you get nice thick stock from lawyers and doctors. Sometimes with small business and start-ups you get thin, flimsy, printed at home cards that make you go “really?” Also, this particular paper had just enough sheen to make the images and color pop, but matted enough to not have people fighting glare and reflection. The color and tonality was impeccable. I am calibrating my monitor all the time to make sure my color and tonality is exactly what I want and I want that reflected in my prints. If I took the time and effort to get this image to look exactly this way, I want you to see it exactly this way. This leads into our next topic, competency. In a digital era where anyone and everyone can have a DSLR and create “professional” images, a print shows the true ability of a photographer to control light. For someone like myself, who is looking to work nationally in print, it shows I can create images where my high lights are not blown out and my shadows are not black. When you print an image that is blown out all white in the sky on a white sheet of paper you can see where the color ink stops and it’s just white paper for your highlights. There are no details left in that area for ink to be laid down. In my opinion, you’ve only created half an image. Prints and the value of them in your work is a different subject for a different blog. So before I get on my soap box, I’ll move one. When it comes to demonstrating competency to a potential client there are several things they are looking for, in my experience. One being, does this photographer shoot our subject matter? There is a reason I have two portfolio books. I don’t advertise it, but I enjoy shooting architecture and interior design stuff. Some jobs, it’s just me and my head phones. Other jobs, it’s me and an assistant or two. There is no dancing for the client or making them laugh. There is no pressure to get a person to emote something. It’s just exploring a beautiful space and creating amazing images that express the story of the room. I would never take my Portrait Book to that meeting or vice a versa. Also, if I am going to meet with someone about commercial images, I pull images that relate to that. There is a huge difference between commercial and editorial. It may not seem like it but, if you look close, there is. What is the subject being discussed? The person or the product? A client wants to know and trust that you can deliver what they are paying you for and that, my friends, is demonstrated by the competency you exhibit with your portfolio. Style is an important part of your business and brand. Dark, ethereal, bright, happy, comedic, sobering, commercial, editorial, beautiful, grungy or composite are all styles that you can represent. These are all qualities that different people and organizations may be looking for. At the end of the day, a true artist has a bit of himself in all of his work and his images represent his style, intuition and sensibilities. On the other hand, he may not be able to create the same images as someone who is more of a tactician. Someone who can recreate certain images that a company wants to emulate or resemble. That’s okay. There is nothing wrong with being the photographer who is good at everything but I would argue that the ‘good at everything’ guy is never the best at anything. Be specific with what you present and what you shoot. The more you can create the images you see in your head and that are meaningful to you, the more you will get hired to create the same for your clients. Expression can mean so many things. For my work and the type of work I choose to do, it relates to the feelings looking at my portraits elicit. It’s happy, sad, coy, reflective, pensive, powerful, commanding, serious and so many others. It’s an expression that speaks to the viewer and tells a story. Whatever that story may be. When you organize your portfolio that’s essentially what you are doing; telling a story. You are trying to make the person viewing your portfolio feel something, trying to get them to experience the full range of your story, your work. When you are photographing someone, it is your job to get some expression from them that relates directly to the story your image is telling. If you can show that you are capable of getting a range of expression in your work, it reassures your potential client that you are capable of expressing whatever is required for their image or campaign. You have to show them that you are capable. A lesson I had to learn was that it doesn’t matter how much you say you can do something. You have to show them before they will trust you. For me, I view my portfolio as a reflection of myself, my capabilities as a photographer, and the stories I want to tell with my imagery. I am part of the process and I have something to say as an artist. If I can convey that to my potential clients through my portfolio, it makes for a great working relationship for all and allows me to feel a part of the project rather than just the person pushing the shutter release. That is a decision that I made. It works for me, my brand, my image, and my desires. You have to do the same with any goal you are pursuing. Make conscious decisions. Be purposeful, create the images you want to create, and you will get the jobs you want.